Chelsea and Everton have been charged by the Football Association after players from both teams were involved in an on-pitch incident. The clubs are charged with failing to ensure their players conducted themselves properly. Chelsea defender Branislav Ivanovic will not face any further action after he clashed with Everton midfielder James McCarthy in the 86th minute. Jose Mourinho's side won 1-0 in Wednesday's Premier League game. But there was controversy late on as Everton had Gareth Barry sent off for a second bookable offence after he tripped Willian. That foul sparked a melee during which Ivanovic locked his arm around McCarthy's neck and then pushed his head towards the midfielder. 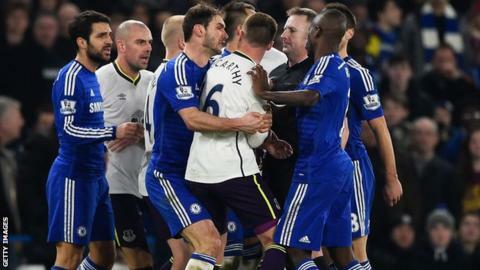 After the game, Toffees' boss Roberto Martinez claimed the Chelsea player should have been dismissed for the contact. "Ivanovic's behaviour is wrong," said Martinez. "He grabs McCarthy around his neck in a very forceful manner, then puts his head against him. James McCarthy doesn't react. In Premier League matches if an incident has not been seen by the match officials a three-man panel of former referees review it after the game and advise if any action should be taken. The FA said: "For an FA charge to follow, all three panel members must agree it is a sending-off offence. In this instance, the panel did not believe the conduct was worthy of a dismissal. " The full charge facing both teams is that they 'failed to ensure their players conducted themselves in an orderly fashion and/or refrained from provocative behaviour'.